A previously unknown type of ceramic vessel was recovered from a site on the route of the N8 Mitchelstown Relief Road, Co. Cork, Ireland. The landscape of the Mitchelstown area is dominated by the Galtee Mountains to the north, the Ballyhoura Mountains to the west and the Kilworth Mountains to the south. The land in the vicinity of the site is for the most part under pasture and is located at an altitude of 90 m OD. The site was located c.1.5km to the west of the town within the historic Mitchelstown Demesne, on the northern bank of the Gradoge River which drains into the Funshion River 700m to the northwest of the site. The course of the Gradoge River in the vicinity of the site has been altered in the recent and historic past. The construction of Mitchelstown Demesne, a parkland of some 1240 acres was undertaken in the eighteenth century. The works included the construction of two artificial lakes to the east of the site. The course of the river in the vicinity of the site has been straightened in the recent past. An area 50m north-south by 20m east-west was excavated on the northern bank of the river. The features identified comprised a burnt stone spread, three pits, a stakehole and a portion of a former channel of the river. One of the pits and the stakehole were located on the edge of the area of the excavation and road corridor, c. 13 m to the northwest of the other features. This pit measured 0.6m by 0.5m by 0.3m in depth. Two flat stones had been placed in the base of the pit and three pottery vessels had been placed on the stones. Three shallow fills were recorded within the pit. A radiocarbon date of 1916-1696 cal BC (UB-6743) was returned from charcoal recovered from the upper fill of the pit. The stakehole was located 1.1m northwest of the pit; it measured 0.2m in diameter by 0.19m in depth. The pottery was examined by Eoin Grogan and Helen Roche and was identified as “an exceptional assemblage, both for the unusual and sequential deposition of the pottery without clear burial evidence and for the nature of the vessels: vessel 1 of the cordoned urn tradition is quite small and unusually fine-walled, while vessels 2 and 3 have no parallels in Ireland.” Grogan and Roche suggested that two distinct phases of deposition took place in the pit. These may have happened within a short space of time as no evidence for a re-cut of the pit was recorded during the excavation. Vessel 1, the cordoned urn, was deposited initially in the western portion of the pit in an upright position on a flat stone which lay at the base of the feature. The vessel is typical of those containing cordoned urn burials but no cremated bone was recovered from the pit. At this stage, it is possible that the pit was the same size as the vessel. Some time later the pit may have been re-cut and enlarged to the east. Two vessels were placed upright in the pit. Vessel 2 is a handled and footed face mask cup and was deposited centrally in the pit. The diameter of the rim measured 0.12m and the internal depth 0.07m. It is decorated by a handle or nose, eyes, lugs or ears and two protruding feet. Vessel 3 is a tub-shaped pot and was deposited upright and intact on the eastern side of the pit beside Vessel 2. The diameter of the rim measured 0.13m and the internal depth 0.07m. Vessels 2 and 3 are of similar fabric. The placement of Vessels 2 and 3 together would suggest that they functioned as a pair. There are no parallels for the two small pots, Vessels 2 and 3, in Ireland. The deposition of three Early Bronze Age pottery vessels in a small pit is a rare and highly significant find. The pots were placed upon two flat stones that lay within the base of the cut on a bed of sandy material. The nature of this stone surface, placement of the pottery vessels, and backfilling with charcoal rich material, would indicate that this pit represents a symbolic and ritual deposit. The site was excavated by Bruce Sutton for Eachtra Archaeological Projects under licence 04E1071 as part of a programme of testing and excavation undertaken on the route of the N8 Mitchelstown Relief Road on behalf of Cork County Council, National Roads Design Office. This project was funded by the Irish Government under the National Development Plan, 2000-2006. The timber building under excavation; the NE entrance is visible in the bottom left corner. In the July 2005 issue of Past, we reported on the first season’s work on an Early Neolithic timber building and pit alignment in the Warren Field, on the Crathes Castle Estate, Aberdeenshire. Those trial results promised well for the recovery of high quality archaeological evidence in a further campaign of investigation. The subsequent field season, directed by Murray Archaeological Services on behalf of the National Trust for Scotland, has fulfilled and even exceeded our expectations. The whole of the building was revealed in 2005, as well as a large area surrounding it – the latter designed to test for the survival of features too small to show up as crop-marks, such as stake holes and small post holes. No prehistoric features of this nature were revealed adjacent to the building. The site has, however, been subject to ploughing from at least the Medieval period, and just as all floor surfaces within the building have been lost to the plough, so too the traces of ephemeral structures such as wattle hurdles may well have been swept away. The building itself was about 24 x 9m externally and 22.5 x 8m internally, lying roughly east-west. The western end of the structure may have been an unroofed yard, the roofed interior being about 18m long and subdivided by a series of partitions. The main entrance was to the north-east, with two narrow gaps between the timbers in the side walls possibly providing light and air to the inner rooms. Identification of structural timbers shows that although oak was dominant, the builders were also using ash and willow or poplar in the main walls, and a species of Pomoideae – possibly hawthorn – in one of the partitions. The bases of the posts had been charred before construction and, as the building was subsequently destroyed by fire, the burnt post pipes were in most cases very clear, demonstrating the use of both round and split timbers. A pattern in which timber structures at mortuary and ceremonial sites, and impressively large buildings, come to the end of their lives through fire is becoming ever more evident in the Scottish Neolithic, leading some researchers to suggest an element of intention rather than accident. The intensive nature of the final conflagration at Crathes, clearly evident from the structural timbers, certainly seems to indicate deliberate burning of the building. There is also evidence for significant replacement of posts at the east end of the building, and a number of replacement or additional posts in internal partitions. This is important, as it suggests that the building stood for some time before its destruction. One of the pits in the pit alignment, showing the two phases of deposition as dark, charcoal-rich deposits at bottom and top of the section. A concentration of flints was recovered from the western end of the interior, with lower concentrations in the centre and the east. Conversely, little pottery was found to the west, with an increasing concentration towards the centre and east end. The latter areas show the greatest concentration of burnt grain. In 2004, barley, emmer, bread/club wheat, and a possible grain of spelt were identified from the east end of the building, with barley being predominant. The 2005 excavations changed the emphasis, with bread/club wheat being the dominant type, with some naked barley and emmer, and a single grain of oat. This may suggest the storage or use of bread/club wheat was more concentrated in the central area. These distribution patterns of artefacts and grains may suggest functional differences between the different areas of the structure; the apparent segregation of different activities may also have had symbolic and ritual significance. Twelve large pits (up to 2.5m in diameter) and five smaller features were identified during excavation of the nearby pit alignment, which stretches some 60m through the landscape on a NE-SW axis. All the excavated pits demonstrated a consistent sequence of events, although the scale and complexity of activity does vary across the monument. In general, a thick deposit of charcoal was placed within each freshly dug pit, followed by a slow, gradual infilling with soil as the spoil from digging eroded back in. Eventually, erosion stopped, with the pits remaining visible as dimples in the landscape. Later, people reopened the pits, depositing material that again included large amounts of charcoal. What was entirely unexpected – and extremely exciting – is the dating of these two phases of activity. A strong series of radiocarbon dates indicates that the pit alignment was created in the first half of the eighth millennium cal BC, while the reworking of the site occurred some 4000 years later. The secondary dates, in the range 3900-3700 cal BC, correspond well with those from the timber building. These discoveries have important implications for our developing understanding of the nature of Mesolithic inhabitation, and of perceptions in the Early Neolithic of the traces of previous activity in the landscape, however those ideas may have been framed. This is true not only for Scottish prehistory, but at a much broader scale as well. The Warren Field Project (Phase II) is supported by the National Trust for Scotland, Historic Scotland, the Russell Trust, Aberdeenshire Council, the Society of Antiquaries of London and the Prehistoric Society. The last few decades have seen an explosion of work on the prehistory of the west coast of Scotland and this has provided a significant contribution to our understanding of the area, as attested by the recent publication of several detailed period-specific accounts, such as Warren’s Mesolithic Lives in Scotland and Noble’s Neolithic Scotland: Timber, Stone, Earth, Fire. Yet, amongst this proliferation of work there has been one area of the west coast that has remained relatively understudied: the Ardnamurchan Peninsula. The sum of recent work on the peninsula is the basic survey of the three chambered tombs identified as part of Henshall’s seminal study of the chambered tombs of Scotland in the 1960s, the small scale excavation of a lithic scatter in the early 1980s and the excavations in the 1990s of the Mesolithic site of Risga in Loch Sunart by a team from the University of Glasgow. Consequently our knowledge of the early prehistory of the area and the key transitions from hunting and gathering to farming and metalworking is limited. However, the small amounts of work that have taken place, as well as details of finds made in the earlier twentieth century and more recently by local amateur enthusiasts suggests that the current paucity of knowledge does not reflect the true record. Indeed, in the light of recent research which has stressed the mobility of the prehistoric populations of the area, and the geographical position and central location of the peninsula between the northern and southern Inner Hebrides, it seems likely that this area could have played an important role during critical periods of early prehistoric change in western Scotland. In light of this, the Ardnamurchan Transitions Project has been conceived as a collaborative project between the Universities of Manchester and Newcastle-upon-Tyne to investigate the transitions between the Mesolithic, Neolithic and Bronze Age in the area. The project is intended to run for five years in the first instance and will use a combination of site-specific excavation and wider survey work to find new material from the periods and to provide a detailed investigation of some already known sites. By doing so, we aim not only to increase knowledge about the peninsula itself, but also to set such knowledge within its wider regional context. 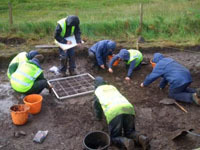 In July and August 2006, the project undertook its first season of work on the peninsula (funded by the Prehistoric Society, the Council for British Archaeology, the Students as Partners Scheme, the University of Manchester and the University of Newcastle-upon-Tyne). This was intended to act as a preliminary evaluation prior to more detailed work in subsequent seasons, yet despite its evaluative nature there is already much to report. We focussed primarily upon one of the tombs that Henshall investigated in the 1960s, the site of Cladh Aindreis (NM 5470 7076), situated within Swordle Bay, between Kilmory and Ockle on the north coast of the peninsula. Cladh Aindreis has been identified by the project as potentially significant for a number of reasons. The tomb was identified in 1860 and has been subject only to basic survey work by Henshall, who noted the irregular cairn shape, and suggested that this had been subject to some modification over time. She also obsrved the presence of shells emerging from a rabbit hole in the side of the cairn. Within Argyll and Bute, at least two other chambered tombs appear to have been built upon earlier shell midden deposits (Crarae and Glecknabae), and a number of archaeologists have suggested that the practice of shell midden accumulation in the later Mesolithic may have acted as a precursor for the building of chambered tombs in the Neolithic. Following this, in the long term the project hopes to examine whether any earlier shell deposits do exist beneath the cairn and investigate the relationship between these. Furthermore, many chambered tombs in Scotland, as well as across the British Isles, have provided ample evidence of later Bronze Age reuse of such monuments. As such, Cladh Aindreis has been selected as a site which may potentially provide us with information about all of the critical periods and transitions that the project hopes to investigate. The site is scheduled, and no excavation was carried out on the monument itself this season. Nonetheless, initial non-intrusive evaluation of the tomb along with survey and excavation in the wider Swordle Valley was highly productive. At the tomb, the large scale clearance of bracken from the cairn suggests that the structure may in fact represent a round cairn which was later subject to modification and to which a longer ‘tail’ was added. Furthermore, excavation outside of the scheduled area, within the forecourt of the tomb, has identified a series of pits with episodes of burning activity and reuse, and we now await the results of a radiocarbon date from burnt material from within one of these pits. Alongside this work, the wider Swordle Bay area was subject to a basic walkover survey and some small trenches were opened to investigate areas of activity that were identified. Of this work, most notable was the identification and partial excavation of a circular possible cairn structure approximately 200m to the northwest of the tomb. This will be more fully excavated in season two. The work in Swordle Bay has been invaluable in helping to develop a further strategy for future excavation to establish the date, form and chronological sequence of the cairn and chamber. Additionally future work will help define the boundaries of the monument of Cladh Aindreis and establish its relation to other sites within the wider bay area. As well as the main excavation work around Swordle Bay and the lower Swordle Valley, a rapid walkover survey assisted by members of the Moidart Heritage group, was undertaken at Sanna Bay, at the west of the Peninsula, and within the hills to the south of Sanna Bay, in the area between Portuairk and Grigadale. Of particular interest were two buried land surfaces revealed by dune blowouts that had previously been identified by local expert Jim Kirby. 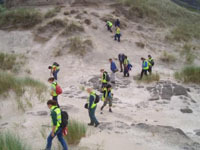 At one of these, a series of eroding land surfaces could clearly be seen within the dune blowout and two different types of pottery were found in these: a burnished piece that is probably medieval and a rougher piece which is likely to be later prehistoric. This area will be examined in detail in future seasons. Season 1 proved highly successful for the Ardnamurchan Transitions Project and all objectives for the season were successfully met. As such, we now have a detailed excavation strategy for the site of Cladh Aindreis, and clear plans for future survey work in Swordle Bay, Swordle Valley and the rest of the peninsula. It is clear that such work will not only contribute significantly to the knowledge of the peninsula but will also provide the critical regional context of information into which sites such as Cladh Aindreis may fit. The far end of the cairn of Cladh Aindreis (the area cleared of foliage) and swordle Bay beyond this, from the south east. However, we hope our project will extend beyond the aim of examining the peninsula within its regional context. By focussing on the question of transitions, this project hopes to challenge and explore the nature of the transitions from hunting and gathering to farming and metalworking, and the rigidity of our own modern preconceptions that surround interpretations of these changes. By moving beyond site-based syntheses, it is our intention to challenge the orthodox picture of prehistory as a series of separate ‘periods’ where objects and remains are divided into functionallydetermined types. Furthermore, we also hope to explore new ways of practicing archaeology. As this project will be assisted in the main part by the work of undergraduate students who will be actively training in archaeology, we hope to use the project to bring together and explore new pedagogical directions that will allow teaching and research to inform one another. Specifically, we are particularly concerned with exploring the potential of such research excavations to provide and develop innovative vocational training for undergraduate students, while at the same time integrating this with critical theoretical issues, something which is rarely undertaken on more traditional excavations. Additionally, we aim to integrate our work firmly within the local community and to develop a strong community-led emphasis in our excavation and survey work. 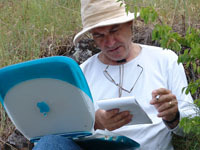 Finally, but most critically, whilst adhering to conventional archaeological methodologies, we also hope to explore and develop reflexive practices that will be archived digitally and which will not only provide new ways of thinking about the practice of archaeology, but will also provide a key resource in the development of such ideas. While this year represents humble beginnings, we hope that the Ardnamurchan Transitions Project will be able to contribute to many things: to the students who train with us, to the community who live in this exciting area and to the general knowledge of the prehistory of the peninsula and of the wider west of Scotland. To keep up to date with future developments please feel free to visit our regularly updated website at http://ardnamurchantransitionsproject.googlepages.com/home, or get in touch at the email address below. First Millennia Studies Group seminar, June 6th 2006, Department of Archaeology, University of Edinburgh. The First Millennia Studies Group (FMSG), organised by Murray Cook (AOC Archaeology Group), Fraser Hunter (National Museum of Scotland) and Roderick McCullagh (Historic Scotland), has regular meetings with one or two-day seminars held in June each year. Meetings of the FMSG discuss a variety of themes relating to Scottish later prehistory and early history, and usually end late in the evening in a pub with a few pints of beer on the table! The main attraction of this very successful group is probably its informality. Here, experts can present their questions, ideas and concerns on a variety of different topics. FMSG do not publish their talks; they are simply a springboard for discussions and further development of ideas. The 2006 seminar topic was chosen because of a series of anniversaries; it has been forty years since Piggott’s invention of his scheme for the Scottish Iron Age (1966), fourteen years since Hingley’s review of the Scottish Iron Age in the Proceedings of the Society of Antiquaries of Scotland (1992), and five years since Haselgrove et al. presented their research agenda for the British Iron Age (2001). The key topics identified in the latter two publications formed the core themes around which the seminar was structured. 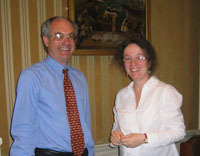 The sponsors of the 2006 Seminar included AOC Archaeology Group, CFA Archaeology, EASE Scotland, GUARD, the City of Edinburgh Archaeology Service and the National Museum of Scotland. The seminar attracted a wide range of archaeologists, historians, students and other people interested in the Scottish Iron Age. This proved to be very useful as different views made the debate even more dynamic. The meeting consisted of seven talks, followed by a discussion. The day was divided into three main parts. In the first part, talks on four different geographical regions of Scotland were presented. The second part discussed topics relating to artefacts and landscapes. In the third part, which aimed ‘for bigger interpretative ideas’, lively discussion took place. The day started with N. Sharples presenting his phenomenological approach to the Western Isles. He emphasized the importance of observing ‘scruffy’ sites as well as impressive ones in order to identify settlement patterns. He also discussed the question of ancestral landscapes and phenomenology, and compared the decoration of pottery in this area with the waves in the sea. Later, A. Heald presented his work on Caithness and emphasized the importance of exploiting antiquarian sources. After a coffee break, M. Davies highlighted the significance of studying transportation and trade based on her study of east-central Scotland. G. Cavers later presented a case study of Galloway in which he pointed out the necessity of clearer terminology for later prehistoric site types. After a well-deserved lunch, a pleasing discussion of artefacts (with plenty of pretty pictures) by F. Hunter began, continued by a very provocative talk by an ‘old plonker’ (speakers own words! ), R. Tipping. He questioned the importance of topics which have represented the mainstream of Iron Age archaeology over the past 40 years, and concluded that we should start thinking of new questions to answer. After coffee, R. Hingley summed up major issues in current later prehistoric research in Scotland and Britain in general. A very fruitful discussion followed. Unfortunately, we all agreed that most of Scotland’s later prehistory still represents a ‘black hole’ in British archaeology. As A. Heald observed, the date 6.6.06 was more than appropriate to discuss these issues! N. Sharples’ comment that “we need to start writing interesting stories” resulted in further discussion of how important informal archaeological meetings like this are. The FMSG seminar was very successful as archaeologists discussed their ideas and made progress with their work in a friendly environment. These presentations and discussions always provide an invaluable source of ideas from different fields of expertise – from archaeologists, historians, enthusiasts and students. At the end of the ‘formal’ part of the seminar, we all agreed that these kinds of meetings are a very good basis for the further development of Scottish archaeology. Where else can experts, students and other people interested in archaeology meet to discuss the size of horses, shape of sea waves, the (un)importance of chronology, and all with coffee and sandwiches in their hands being taken seriously by everyone else in the room? Lively discussion continued at an evening wine reception in Hunty House, Edinburgh. At the end of the day, we were all full of new ideas on how to take the next step in Scottish Iron Age archaeology. These ideas are now developing further and are being written about in publications (usually with milder language than that sometimes heard at the FMSG seminar!). As for me, the seminar was productive in more ways that one, but the most important realisation was that any idea is a good idea and can be developed further. I have made a note in my diary for the 5th June 2007 FMSG day seminar already. The new President of the Prehistoric Society is Professor Clive Ruggles of the University of Leicester. Clive arrived in archaeology by a circuitous route that began in mathematics (MA from Cambridge) and astrophysics (DPhil from Oxford) and progressed via computer science and geography (not to mention a brief spell computerizing signalboxes for British Rail). He embarked on his archaeological career in Cardiff in the late 1970s as a research assistant to Richard Atkinson, undertaking a detailed critique of Alexander Thom’s ideas about ‘megalithic astronomy’. Although much of his subsequent work concerned computing and statistical applications in archaeology, Clive is best known for his lifelong interest in people’s perceptions of the sky and celestial objects in various social contexts. These topics are encapsulated in the fields of study that have become known as archaeastronomy and ethnoastronomy, and in 1999 Clive was appointed Professor of Archaeoastronomy at the University of Leicester, apparently the first such post in the world. The focus of much of Clive’s fieldwork over the years has been Neolithic and Bronze Age monuments and landscapes in Britain and Ireland. This has succeeded in turning a largely sterile (and often openly hostile!) debate between astronomers and archaeologists into a productive field of enquiry that is providing significant new insights into prehistoric cognition and cosmology. This work is best summed up in his book Astronomy in Prehistoric Britain and Ireland, published by Yale University Press in 1999. For the past two years, Clive has been working on a critical synthesis of European archaeoastronomy funded by a Major Research Fellowship from the Leverhulme Trust. He also has ongoing field projects in Polynesia and Peru. Clive has a double presence at Burlington House, where he is Chair of the Astronomical Heritage Committee of the Royal Astronomical Society, as well as being a Fellow of the Society of Antiquaries next door. On the international stage, he has been working with UNESCO in the development of their Astronomy and World Heritage initiative. This has succeeded in establishing a new criterion by which cultural properties around the world may be considered as possible World Heritage Sites – their connections with the skies. Clive has recently published Ancient Astronomy: An Encyclopedia of Cosmologies and Myth (ABCCLIO, 2005), aimed at a general audience in the USA, and was also an assistant editor for Songs from the Sky: Indigenous Astronomical and Cosmological Traditions of the World (Ocarina Books, 2005). His forthcoming books include Cultural Astronomy in New World Cosmologies (University Press of Colorado) edited with Gary Urton from Harvard; The Heavens Above: Astronomical and Space Heritage, a WAC volume edited with John Campbell from James Cook University in Australia; and Na Inoa Hoku: Hawaiian and Polynesian Star Names, co-authored with Rubellite Kawena Johnson and John Kaipo Mahelona from the University of Hawaii. When he is not gadding around the UK, Europe or the world, either doing fieldwork or giving public lectures and generally trying to deconstruct popular misconceptions about archaeoastronomy, Clive is to be found back in Leicestershire with his wife and four children, dog, cat, ponies, chickens and fish. Clive has been involved in several of the Society’s study weekends and is delighted to have been asked to become President. He will be retiring shortly from his teaching duties at Leicester, and looks forward to the opportunity that this will give him to take an active part in a much wider range of the Society’s activities. In 2007, there will be vacancies for 6 members of Council. Members are invited to propose nominees for election at the next AGM. Nominations should be in writing and accompanied by an indication of the nominee’s willingness to stand, the name of a proposer and a seconder, and a short supporting statement from the nominee. Nominations must be with the Hon Sec by 31st December 2006. This year’s Sara Champion lecture was given by Dr Joanna Brück, lecturer at University College Dublin and editor of PAST. Her talk, ‘Landscape politics and colonial identities: Sir Richard Colt Hoare’s tour of Ireland, 1806’, looked at the social and cultural context within which antiquarianism and archaeology developed in the early nineteenth century. Sir Richard Colt Hoare, often regarded as one of the founding fathers of British prehistory, travelled widely both in the British Isles and beyond. His published tour of Ireland has much to say about the Irish landscape, its antiquities and inhabitants. The lecture explored how Colt Hoare’s descriptions of what he saw were informed by contemporary social and political concerns, so that landscape (and its constituent elements) acted as a metaphor through which colonial and national identities were constructed. The talk was followed by plenty of discussion - and a few drinks afterwards in a local pub! Please note that the joint Prehistoric Society/CBA Eastern Region/Quaternary Research Association dayschool in honour of John Wymer will be held in Norwich on Saturday 31 March 2007, not Wednesday 11 April as advertised in the last issue of PAST. Lewes Town Hall, 2pm Saturday 10th February 2007, entry £2. Places must be booked in advance. Cheques should made be payable to ‘Sussex Past’, and sent to Lorna Gartside, Sussex Archaeological Society, Barbican House, 169 High Street, Lewes BN7 1YE. What a culinary and comfortable extravaganza awaits us at Dillington every year as well as the knowledge that we will be hearing and meeting people with great archaeological expertise. This year, we were to hear and see information on the ‘up-todate research concerning how farming, fields and settlement became located and fixed into a concept of landscape which, to a large extent, has resonance today’. Lovely day for it! The Dillington House gang hitch a ride to the top of Shearplace Hill in the driving rain (photo: Julie Gardiner). The list of speakers, Dr. Mike Allen, Dillington’s own Wayne Bennett, Dr. Martin Green, Dr. Bob Johnston, Prof. Mike Parker-Pearson, Dr. Francis Pryor, Dr. Gary Robinson and Dr. Nick Thorpe, revealed a wealth of knowledge and interpretation of evidence for us to absorb in a short time. They covered subjects from the Hebrides to the Scillies (with an interlude in Norway) and Mesolithic times to the Iron Age using both slides and modern computer technology to explain their up-to-date research and its implications for the way we think about prehistoric life. The value of earlier archaeological study and excavation was shown to provide a firm basis to which new information, available through modern investigative scientific techniques could be added. How envious those earlier archaeologists must be of our ability now to discover where people were brought up, what their diet was like, where they obtained their raw materials for tools, pots, etc., where imported goods originated from and so on. The down side of this new understanding is the regret that so much information has been lost by the passage of time, the natural and man-made destruction of sites and our inability to think as they did. It is impossible to put the information imparted to us by our eight lectures in a short résumé of the weekend. Suffice to say that in the future wherever we see humps and bumps in the ground or visit or revisit settlement sites of the prehistoric period, among the questions we will be asking ourselves will be such as: What do we mean by ‘landscape’? What did prehistoric people consider their ‘landscape’ and how did this relate to their surroundings? What factors were important in their choice of settlement site - size, visibility, food production etc.? Were they weary of not having a static life where they could plan for their needs through the seasons? Did they live near track ways where they could trade with travellers or did they set up an “inn at the cross roads” for those travellers? Would they be suitable distances from other needs, e.g. flint for tools or clay for pots? Could they re-use ceremonial sites nearby or create new ones themselves? Would they be safe from marauders - human or animal? Did field boundaries and lynchets keep things in or out? How many generations might use a site refurbishing old houses or building new ones? Did they need garden plots as we have today? These thoughts and many more new ideas were left for us to consider when trying to understand the lives of these early people. On Sunday in driving rain and gale force winds, and led by Wayne Bennett, Mike Allen and Julie Gardiner, we tried, with lots of discussion, to comprehend the reasons for people to settle on sites such as Shearplace Hill and Ringmoor Down, the former of which has suffered much from erosion since it was originally excavated. Martin Green’s farm provided a welcome refuge for our very late lunch in his barn and then the sun came out - for a bit! This gave us the opportunity to see further into the landscape than had been possible in the morning and Martin showed us some areas he had described in his talk. We were particularly interested in the large shaft that he had excavated to a depth of 12m and which had been augered another 12m without reaching bedrock and the variety of monuments which could be seen in this part of Cranborne Chase. His museum is fascinating with an amazing number of artefacts from his land which visitors can handle and feel how expertly they were made for the jobs people needed to do. Finally we had tea and home-made Dillington cakes before leaving with our great thanks to all our speakers and Wayne Bennett for his organisation of an excellent weekend. Dr. Martin Green (left) with Prof. Richard Bradley, University of Reading. It is rare to receive an honorary degree, rarer still for an archaeologist to do so, and even more exceptional when that honour is given entirely on academic merit, and to a self taught expert. It is, therefore, with exceptional pleasure that we announce that Martin Green, former council member, was bestowed with an honorary doctorate from Reading University in July. Martin Green, farmer, antiquarian and self-taught archaeologist, admits ‘bunking off’ school to field walk on the farm and to visit Salisbury Museum to examine their collections. He has demonstrated his huge contribution to British Archaeology through his own private excavations on his land over the past 30 years. These have resulted in a major publication in collaboration with Richard Bradley and John Barrett (1991), and more recently his excellent best-seller A Landscape Revealed (2000, Tempus). Nevertheless, his research continues and he is in the final stages of completing a significant publication collaboration with Dr Charly French (Cambridge University) and Dr Mike Allen (Wessex Archaeology) among others. Other research and fieldwork will soon commence as he continues this unique legacy. He is the most professional amateur in the country, his work is important, his achievement unique, and this honour richly deserved. Congratulations, Dr Martin Green. Call for feedback to assist in the update of the Archaeological Research Agenda for the Avebury World Heritage Site. If you have ever used the current research agenda, we would very much welcome your help in its evaluation and suggestions for its update. Please could you give your feedback on the short questionnaire available online at http://www.kennet.gov.uk/aveburyresearchagenda. For further information or a hard copy, please contact the World Heritage Site officer, Sarah Simmonds on 01380 734820. A little-noticed but remarkable conference took place this summer on the site of Salawusu in Inner Mongolia, China, organised by the IVPP (Institute of Vertebrate Palaeontology and Palaeoanthropology), Chinese Academy of Sciences, Beijing. Salawusu (or”Sjara-osso-gol” in the old spelling) was first discovered by the French Jesuits Émile Licent and Teillard de Chardin in 1922, and is important in containing an Upper Pleistocene fauna, some fragmentary human remains (“Ordos Man”) attributed to late H. erectus, early modern humans or Neandertals, and a simple flake and core technology (the evidence is superbly presented in the recently opened museum in Galatu County). The dating of the Ordos material has been uncertain, but it is probably older than first suggested, and likely to belong to the last interglacial. In a region where welldated hominin remains are scarce, Salawusu is an important reference point; as it lies in the Ordos Desert at the eastern end of the corridor north of the Tibetan Plateau, it is also well-placed to show the presence or absence of links with sites in Central Asia. A view of the Salawusu Valley, the sides of which are composed of Upper Pleistocene sand that overlies fluvial deposits. These date from the last interglacial, and contain some of the archaeological evidence discussed here. The conference was preceded by an excursion organised by the IVPP to the Nihewan Basin, which contains the oldest sites so far discovered in northern China and is without question (at least in terms of its sedimentary and faunal sequence) the East Asian equivalent of Olduvai Gorge (the discoveries at Nihewan are accessible via English-language publications by – amongst others – the late Desmond Clark, Susan Keates, Ric Potts, Kathy Schick and Nic Toth). The Nihewan Basin covers 9000 sq km and lies c. 50 km southwest of Beijing. It was first investigated by Licent and Chardin, and contains a 1000m sequence of lacustrine and fluvial sediments, the base of which dates back to c. 1.7 Mya. Until recently, the oldest site in North China was thought to be Donggutuo, dated to c. 1 Mya. In the last five years, Chinese scientists have excavated and dated others that are older, notably Xiaochangliang (1.36 Mya) and most recently, Majuangou III, dated to 1.61 Mya by palaeomagnetism and estimates of sedimentation rates. As there are at least 10 metres of deposits below Majuangou III, the possibility exists that even older sites might be found – as might the still-elusive hominin remains. Those on the excursion were able to visit these sites by a sometimes hair-raising descent into the depths of the basin, accompanied by Wei Qi, one of the most senior Palaeolithic archaeologists in China. The lithic assemblages from these sites are very crude and unstandardised, and are made mainly from small nodules of local, low quality chert that often shatters when struck. Faunal remains at the principal archaeological sites are often very fragmented (possibly by sub-aerial exposure or trampling) but there are palaeontological sites where mammalian fossils are well-preserved, such as the new one of Shan Shen Miao Zui. Although attention was rightly focussed on the earliest sites, later ones such as Maliang (Middle Pleistocene) and Houtouliang (Late Pleistocene) were also visited and are important components of the North Chinese sequence. Another site included in the excursion was Xujiayao, which lies outside the Nihewan Basin and dates to the last interglacial. As at Salawusu, it has some fragmentary hominin remains and the usual type of unstandardised flake and core assemblage for this part of the world. Over 30 papers on a diverse range of topics were presented at the conference. Topics included the environment, dating and lithic assemblages of Salawusu; the late Pleistocene Chinese fossil hominin record; details of a new site in southern China with possible Mousterian affinities; and presentations from South Korean colleagues on the late Palaeolithic of their country. Fangjiagouwan, a new site in the Salawusu Valley and currently under investigation, was also discussed. A morning at the conference was spent visiting this site under the guidance of Hou Ya-mei, Huang Wei-wen and Tong Haowen (IVPP), the senior investigators. This site has a superlative 60 metre section: the basal deposits of the Sulawusu Formation are lacustrine, date to the last interglacial, and contain the cultural layer, and hominin and other mammalian remains. The overlying Chenguan Formation documents the last glaciation in great detail, with very finely laminated sands and silts from intermittent, low-energy streams that are followed by wind-blown sands deposited under very cold desert conditions in the Late Pleistocene. My own interpretation of the Palaeolithic occupation of this region is that it was occupied briefly in the last interglacial, and was then uninhabited as conditions deteriorated until the arrival of groups (possibly from north-east Siberia) with an Upper Palaeolithic type of micro-blade assemblage after 25000 BP. To end on two general points: first, as China increasingly affects our lives, so too will its Palaeolithic record. There is now a small but lively group of English-speaking Chinese researchers at the IVPP and elsewhere, and they will undoubtedly provide important new information on the Chinese Palaeolithic in the next few years (the loess plateau of northern China also contains the best terrestrial Pliocene and Pleistocene palaeocolimatic record in the world). For those readers interested in visiting China, there is also much to see in Inner Mongolia and neighbouring Shanxi Province, such as Datong and its 11th century Huayan Monastery, the Grottoes of Yungang (5th century AD) which contain more than 50,000 statues of Buddha, the ruined 8th century AD mud-brick city of Tongwan, and the Mausoleum of Genghis Khan. The scenery, people, music, singing and food of Inner Mongolia are wonderful, and there has been heavy recent investment in tourism. As one of many surprises, the charmingly entitled Inner Mongolia 3rd International Grassland Culture Festival performed the finest ballet and music I’ve ever heard. We will doubtless learn much more in the next few years about the archaeological record of this important and fascinating region. Dept. of Archaeology, Sheffield S1 4ET. Many, many thanks to colleagues at the IVPP for their hospitality and for organising the conference, and to Zhang Xi-ling and Zhang Yue (IVPP), the leaders and interpreters of the excursion to Nihewan. Armenia, located in the Caucasus and sometimes referred to as part of Eastern Europe/the Newly Independent States (NIS Republics), is a culturally rich and politically complex country. Bordering Turkey, Azerbaijan, Iran and Georgia, its archaeological record reflects its diverse cultural and social contacts with European, Middle Eastern, and Asian influences, while also acting as an independent and unique region itself. Its archaeology includes concentrations of rock art that are known on the Aragat and Gueghama mountain ranges while sites such as the Bronze Age cemetery and Iron Age hillfort at Lchashen identify Armenia as a region with broad trade and exchange networks. The site of Ukhtasar is located within the prominent Syunik mountain range in south-eastern Armenia. Situated at c. 3,300 m high within an extinct volcano, Ukhtasar is inaccessible for much of the year with accessibility possible in the summer months. Within the inner crater is a glacial lake, turquoise circular pools, meadows and boulder streams that are characteristic of the geological formations of this area. Rock art is found located on a number, but not all, of the boulder streams. The site was first discovered by archaeologists in the 1960s and documented by Safian and Karakhanian’s The Rock Carvings of Syunik in 1970. Safian and Karakhanian noted “graphic and voluminous” rock carvings located horizontally or vertically on the flat surfaces of rocks and they recorded the art with schematic monochrome drawings of the depictions. However, while the site is known of, and to some extent recorded, it is little understood. The Ukhtasar Rock Art Research Project is studying in detail the rock art in terms of its composition and considering how the rock art relates to its location within the inner dimensions of the volcanic crater and its wider landscape setting. The project aims are to analyse the distribution of rock art within the crater (c. 1.5km x 2km according to GPS data) with the purpose of finding patterns and links between the use of the landscape and stylistic form of the rock art. It adopts a number of methodological and theoretical approaches that include modelling of the landscape using GPS, GIS and remote sensing, recording the rock art with a range of visual methods and techniques, and the development of phenomenological research methods in order to make a detailed in-depth study of the rock art within the context of the natural features of the landscape, and to enhance how we study and develop our understanding of prehistoric rock art sites in terms of their composition, construction, patterning and landscape referencing. As such, the project adopts and combines a number of perspectives as to how the rock art is recorded and interpreted. This is seen by the project directors as a route into developing an understanding of the social and ritual construction of the prehistoric and historic landscape of Ukhtasar and the Syunik region, thus providing a comparative study to rock art locales in other regions of Armenia and beyond. The pecked rocks, also known as ‘goat letters’, have been broadly dated from fifth millennium BC to the second millennium BC, based on stylistic traits. The concentration of rock art is located within the inner landscape of the crater, although there are a number of rocks that appear to mark the journey up to the site from various routes (this will be investigated in more detail in forthcoming seasons of fieldwork). Rock art is located on rock surfaces that are flat, have a black and shiny patina and striations that are the outcome of glacial action. The surface of the rock appears to be polished and is highly reflective. In our first season of work we selected two areas of rock art in contrasting locations of the crater and situated within two separate boulder streams. The rock art had shared and individualistic depictions of a range of animals, human figures, carts and abstract images. Sample Area 1 (SA1) was located within a small circular boulder stream on the edge of the boulder mass and within the central areas of the crater. Sample Area 2 (SA2), in contrast, was chosen for its close proximity to the glacial lake and its contrasting location near the edge of the crater rim. Initial survey was conducted using GPS to begin the mapping process of the inner crater landscape and an additional survey was conducted recording rock art located out of the boulder stream area. Recording of the sample areas has produced interesting initial results. For example, both areas contain images of goats, deer, human figures, abstract images and what appear to be panthers and tapirs. SA1 has a concentration of images of carts that are depicted in plan form. This way of representing the carts references the placement of them within burial contexts found within lowland cemetery sites. Unlike SA1, SA2 has no cart depictions but does have a higher concentration of human figures depicted in a contrasting range of styles and gestures. Furthermore, both sample areas and the site as a whole are the focus for the depiction of bezoar goats. However, rather than being represented in an homogenous way, the goats are portrayed in a wide range of styles, gestures, locations and either singularly or in combination with other goats, human figures, deer and abstract images. Our recording of the location of the goats in the sample areas observed a predominant pattern of goats facing in directions that point to gaps in the crater profile and routes out of the crater landscape. In addition, there is evidence for the propping of a number of rocks that alters the angle of the rock face. This has a number of effects: it makes the rock face and the rock art more visible from a distance, it facilitates an observance of the orientation of the direction in which figures (either animal or human) are facing and in the case of SA1 creates a kerb of propped stones around the edge of the boulder stream. Our initial work has identified a number of interesting patterns emerging between what is depicted, how it is depicted and where it is located within individual boulder streams and the crater profile as a whole. Evidence from the two sample areas leads to a consideration of possible relationships existing between the images, the rocks they are depicted on and their landscape setting. As the aims of the project are to discover links and patterns between the variety of rock art, its characteristics, distributions in space, the physical environment, and to develop an understanding of the social and ritual construction of the prehistoric landscape, our initial work has been fruitful. It has set the scene for the development of the project which aims to continue recording the rock art, develop research methods in rock art studies and to conduct ethnographic research, particularly in the area of the nearby town of Sisian and surrounding villages, as a route into gaining a better understanding of the significance of the site and its rock art within a contemporary and local context. The project directors (Armen Asryan, Kingston University, UK; Fay Stevens, Institute of Archaeology, University College London, UK; and Anne Walkling, freelance photographer) would like to express their thanks to the British Council in Armenia who partially funded the first season of fieldwork and to Broncoway LLC (Armenia), Howard Lee and Richard Walkling for their contribution to the project. The site of Uushigiin Uver is situated 20kms west of Mörön in Hövsgöl, Mongolia’s northernmost aimag (or province), and only about 100kms from the Russian border. Here, on a low plain near the confluence of two rivers and surrounded by the steppe grassland and high mountains which characterise this remote area, are three rows of standing stones or stelae. In all, there are 14 monoliths of various different rocks which have been imported from a number of unknown sources and set on end to create one of the most impressive prehistoric sites in Mongolia. However, the stone rows are also surrounded by a large number of low mounds (kheresurs or khirigsuurs). Most unusually, the upper part of one monolith is carved with a human portrait complete with earrings and neck ornament but the lower part of this stone, as well as many of the others, bears pecked symbols in the shapes of animals, discs, belts and weapons. The most distinctive of the animal symbols is a stylised red deer depicted in a flowing, ‘flying gallop’ posture. Prehistoric rock art occurs throughout Central Asia. Although most representations occur on natural rock faces, some have also been pecked into freestanding blocks. The individual motifs are sometimes abstract, or may appear to show humanlike deities, but more frequently they are naturalistic and based on the animals found in the local environment. Much of the art remains poorly dated and its meaning largely opaque but, as in other rock art traditions, it is probable that the motifs were symbolic and portrayed spiritual metaphors only properly understood within the belief systems of the time. Various different styles have been discerned and some have been related to the decoration employed in other media. The Late Bronze Age and Early Iron Age Scytho-Siberian tradition of the seventh to fourth centuries BC is one example which is well-known, not least because of the richly ornamented grave goods from the tombs of the Pazyryk valley in southern Siberia and beyond. In Mongolia itself, it is generally believed that the ancient inhabitants considered themselves to have been the descendants of Maral-goa, a deer, and hence the animal was probably totemic. More than 600 examples of stones decorated with deer (and normally referred to as ‘deer stones’) are known between Southern Siberia and Xinjiang in China. Some are thought to have marked the positions of burials but recent research in Mongolia is shedding new light on the more complex functions of such sites. Little was previously known about the archaeological context of the striking site at Uushigiin Uver but since 1999 it has been the subject of an extensive collaborative research programme which is now in its fifth field season. Under the direction of Takahama Shu, Professor at Kanazawa University in Japan, the joint Mongolian-Japanese venture began by exploring some of the kheresurs but has now moved to the stone alignments. Through limited excavation, they have discovered that the site is much more elaborate than surface indications would suggest and that both the visible mounds and the standing stones are surrounded by many smaller enclosures and satellite cairns, now completely buried. Some of these contain horse skulls facing east, occasionally with attached neck bones and hooves, and during the 2006 excavation, for the first time, another carefully placed horse skull was discovered beyond the limits of the mounds. Although a stone slab cist was found below one of the large mounds, it did not contain human remains but traces of animal bone and pottery sherds. This evidence can be added to that from other sites which suggests that many of the stone structures were not primarily funerary in function. Horses are essential to the nomadic lifestyle of the majority of modern Mongolians and horse skulls continue to be used in shamanistic practices, the display of the skulls of race-winning animals adding to the spiritual potency of ceremonial structures. It is hoped that the research project at Uushigiin Uver will shed light on the origins of such practices and provide much-needed information on the society that erected the deer stones. Although the three principal forms of stone structure found at Uushigiin Uver – slab cists, large cairns and stelae – are found elsewhere in northern Mongolia, the chronological and cultural relationship between them is poorly understood. Radiocarbon dating of samples from the site has not yet been successful but, on the basis of the pottery assemblage, it is thought that the structures were built about 1000 BC. Elsewhere in Mongolia few dates have been obtained from comparable sites but these tend to suggest that the tradition of building in stone started in the mid to late second millennium BC and continued for about a thousand years, although some of the sites were later re-used by different societies. Clearly, the excavations at Uushigiin Uver are of the utmost importance to the identification of the chronological and cultural links of these ancient Monoglian sites. I am grateful to Takahama Shu and Takuya Soma for taking the time to explain the excavations and wish the team every success with their project. More can be learned from their website (http://www.kanazawa-u.ac.jp/-steppe/new15.pdf).